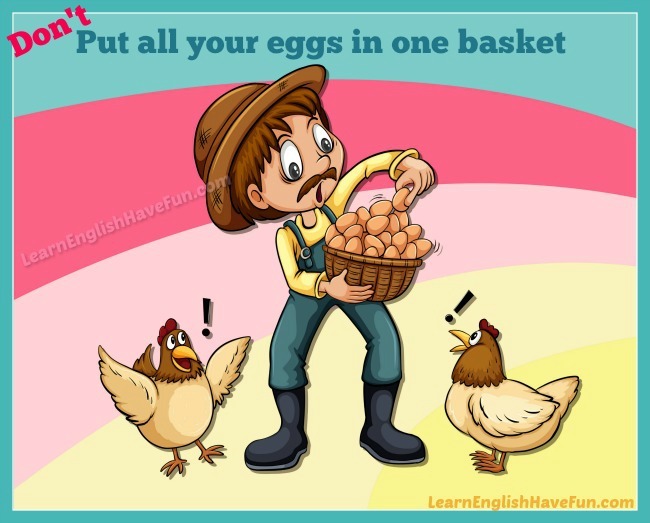 Can you guess the meaning of the idiom 'put all your eggs in one basket' from the picture? (don't) put all your eggs in one basket: having all of your resources or efforts in just one possibility is very risky. This advice explains that if someone puts all of their eggs in one basket they risk the possibility that they might drop the basket and all of the eggs will break. So the idiom is often used in the negative form: don't put all your eggs in one basket. The "eggs" in this idiom can represent anything such as money, investments, hopes and dreams, plans, ideas, work, etc. This expression can be used for any 'person'. In other words, the idiom is really "put all ONE's eggs in one basket." (my / your / his / her / its / our / their basket). Don't you think submitting only one college application is putting all your eggs in one basket? I put all my eggs in one basket when I quit my job and moved out west—fortunately, I found an apartment and a job before I spent all of my savings. Athletes often put all of their eggs in one basket and when they get seriously injured their careers and lives are ruined. I was so sure that I'd get that job that I turned down two other employment offers. Of course my parents warned me not to put all of my eggs in one basket. Let’s diversity our stock investments—putting all our eggs in one basket is too risky. I really want to be an actor but I've started writing screenplays and have also learned how to edit because I don't want to put all of my eggs in one basket. Are you sure you should have the surgery done without at least one more doctor's opinion? I hate to see you put all your eggs in one basket for something so important. I know it's stupid to put all my eggs in one basket but I really feel like this is an amazing investment opportunity. We sold our house and used our pension to fund our failed business venture—I knew it was foolish to put all our eggs in one basket. You need to get a financial adviser who can help you manage your money because you're risking everything by putting all your eggs in one basket. Don't you think you might be putting all your eggs in one basket by only trying to get dates with supermodels? My son put all his eggs in one basket by only applying to Harvard University, but luckily he was accepted. I hope you understand you're putting all your eggs in one basket by dropping out of school to accompany your boyfriend and his band on their tour. My grandparents put all their eggs in one basket when they only invested in one stock back in the 90's—thank goodness it was Microsoft! Have you had a chance to sign-up for my free newsletter? It's the best way to learn about new updates to my website. It' practice time—simply write your own example sentence in the comments box and I'll give you feedback. Remember only practice makes perfect. You can't learn a language easily if you only passively read what other people have written.